Crappie are predatory fish of the genus Pomoxis. Two species are recognized by science: P. annularis, commonly called the white crappie, and P. nigromaculatus, also known as the black crappie. Both species change colors throughout the season, and by pattern alone, they can be tough to tell apart. The surest way to tell the difference is by counting spines on the dorsal fin. White crappie will have six spines; black crappie sport seven or eight. Now, you might be tempted to think we’re just playing taxonomical games to show off, but there are real behavioral differences between these two species, and you need to know which one you’re fishing. 2.1 What are the behavioral differences? 2.2 What are the behavioral similarities? Get chumy – If you’ve got live bait with you, try mashing a few minnows or worms into a paste and dropping them into the water. That scent carries for quite a distance, and acts as a dinner bell for crappie. You’ll very quickly discover whether there’s a school holding to the bottom or one suspended just beyond your transducer angle. Slow down – Crappie are aggressive predators, but if you fish them under the ice like you would in open water, you’re making a big mistake. Cold-induced torpor slows them way down, and your presentation needs to slow down to match. Jig gentle and with finesse, try slow movements, and don’t expect the fish to move far or fast. Use lighter line in winter – If you regularly use 4 pound test mono in summer, you might try dropping to 2 in winter. Why? Crappie have excellent eyesight, and the thinner your line the better. Experiment with nearly invisible fluorocarbon or super-slender braided line, too. The harder you make your line to see, the more crappie will hit your jig. Go small – 1/16th and 1/32-ounce jig heads are about as big as you want to go with hard water crappie, and you need to keep in mind that they won’t chase prey that’s quite as large as they would in summer. Black crappie are abundant as well, though their native range has been lost to time. If you’re fishing in the lower 48, black crappie are probably there. Again, the easiest way to know which species you’re fishing is to catch one and count those spines. What are the behavioral differences? The young of both species feed on zooplankton and tiny invertebrates, moving on to predate on small fish like shad. As they mature toward adulthood, however, black crappie tend toward invertebrates like worms and insects, while white crappie prey on small fish and large invertebrates like crayfish. White crappie, then, are more piscivorous, and you’ll need to take that into account when selecting lures. Black crappie are more likely to make their homes in clear water near lots of vegetation and cover. By contrast, white crappie can be found in muddy or strained water and are not adverse to schooling in the open. If you’re fishing for black crappie, look for clear water over weed beds. White crappie can be found in weeds, too, but they’ll also school away from cover and in murky water. In fact, I’ve caught them in water that was as dark as strong iced tea! What are the behavioral similarities? Both white and black crappie are morning and night feeders. Prime hours are the 90 minutes surrounding dawn and midnight to 2 a.m. That said, as we’ll explore below, afternoon can be an excellent time to find these fish biting in shallow water. Crappie have an unusual, energy-conserving feeding pattern. They stop to hunt, locating prey by sight. This avoids wasting energy cruising for food, and it’s something the knowledgeable angler will use to his or her advantage. Once you find a school that’s still, they’ll be looking for prey, and you can keep dropping jigs to them, catching fish after fish. Another thing to keep in mind is that crappie of both species really slow down in the winter. All that cold water makes them very lethargic, and they won’t move much or be inclined to chase food. If you understand crappie behavior, you’ll know where to find them. That’s one reason it’s important to recognize which species you’re after. At the start of winter, crappie of both species will be holding to where they were in the fall, often in relatively shallow water. But as winter deepens, so too does the water the crappie move to. By mid-winter, for instance, you’ll need to start your search in basins and channels. By winter’s end, crappie are moving to their spawning grounds, which are usually flat, deep bays. They can be muddy or rocky, and these spawning grounds can be hard to predict unless you know the lake you’re fishing. But crappie are even more predictable than you might imagine. They follow a pattern, and what one school does, another will, too. For instance, if you find one school hanging at 12 feet on a point, there’ll be another one just like it on a similar feature. Plan ahead, and drill your holes over similar points, channels, and shallow weed beds. That way, when one school stops biting, you can easily move to the next. On flat, relatively featureless ponds and lakes, crappie are going to hang near the bottom. In fact, they sometimes sit with their pectoral fins almost touching the lake bed, and they may be all but invisible to your flasher. This can be true for any body of water, and just because you can’t see a school doesn’t mean it isn’t there. Try jigging a foot or so off the bottom. 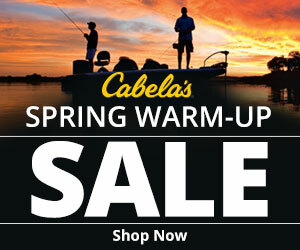 You just might see a mob of crappie appear out of nowhere! As a rule of thumb, white crappie will cluster in open water near a drop-off, while black crappie will hover in or around live weed beds. Both species can sometimes be found in deep water near the bottom. You can take advantage of these variations by carefully studying a contour map. Select the most likely spots, carving a larger lake into manageable portions. Locate similar features, and auger enough holes to give you options. Once you find a school, remember, others will be holding over similar structures at the same depth. Crappie are often caught in 20 to 30 feet of water, but many experienced anglers know that they move to shallow areas in the afternoon, as the water heats up. That can make evening a prime time to catch them, even though they’re generally more active in the morning. Look for shallower water that holds the prey items they love. Crappie can be voracious predators, and when they turn on, get ready! Jig selection is another question that can be answered in part by your knowledge of the species you’re fishing. All the jigs we detail below will work on both species, but black crappie are more likely to take the ones that mimic insects and larvae. White crappie, by contrast, are a bit more likely to hit anything that looks and moves like a minnow. Small jig heads are essential crappie tackle, and we like to have a variety of colors on hand. 1/16 and 1/32 ounce heads are ideal. You need to keep them small, especially in winter. Eagle Claw’s jig heads are a popular choice on the ice, and they come in a great range of colors. Designed much like a fly, these pre-made jigs are deadly on black crappie. 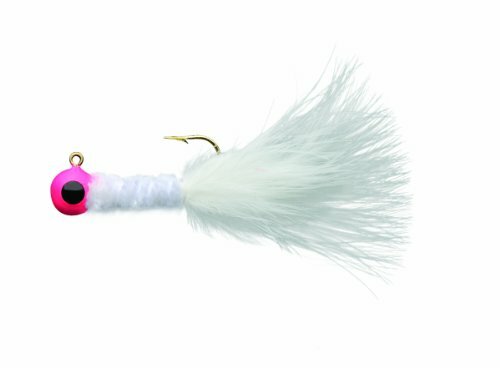 Mimicking an insect, the skirt on these jigs floats and flutters, tantalizing crappie into a strike. We particularly recommend chartreuse and white. 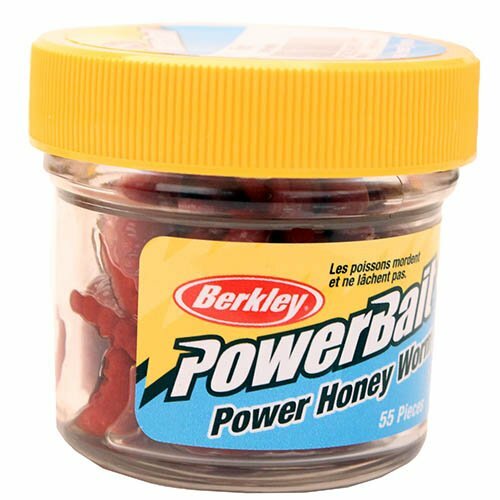 Sweetening a jig is always a good idea, and if you want to work with a soft bait rather than live options, Berkley’s Honey Worms are a fantastic option. Just one inch long, these faux-larvae, saturated in scent and flavor, are a fishing staple. 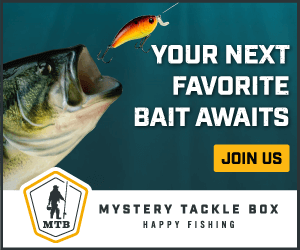 White crappie love minnows, and if you’re having trouble finding live bait of the right size–tiny!–Berkley’s got you covered. Just 2 inches long, these shad-imitating soft baits feature a tail that wriggles to provoke a strike. Always an excellent choice for crappie, everything from minnows to worms to insects can be used to sweeten a jig. Make your choice based on the species you’re chasing. Crappie are one of my favorite fish to catch, and their propensity to school means that once you get into them, your rod will be on fire for quite some time! Study your nearby ponds and lakes, drill a variety of holes, arm yourself with tiny jigs, and follow these tips and tricks. Armed with the specie-specific know-how you need, you’ll have hours of fun pulling these tasty meals onto the ice.